On December 8, 1864, 150 years ago today, Grant’s Seventh Offensive was in full swing, as a large corps-sized force under Gouverneur Warren was headed across the Nottoway River en route to the Weldon Railroad, its mission to wreck the rails as far south as possible. 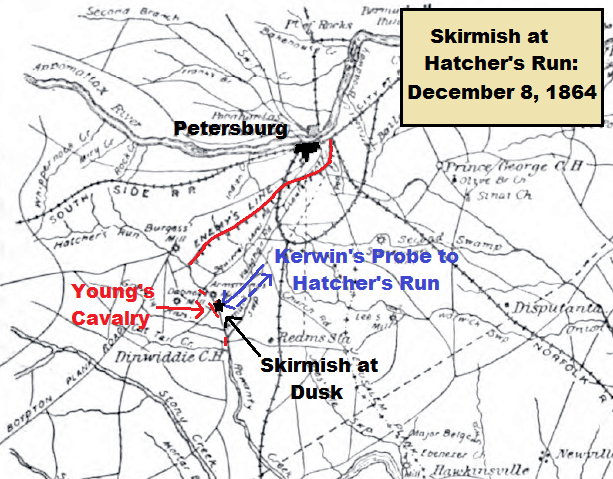 A sidelight of Warren’s Stony Creek Raid, a cavalry reconnaissance southwest down the Vaughan Road to Hatcher’s Run, is the subject of this post. If the enemy send off two divisions after Warren, what is there to prevent completing the investment of Petersburg with your reserve? I don’t think the information of the sending of two divisions after Warren is as yet sufficiently positive to justify an attempt to complete the investment of Petersburg. It would appear that Mahone only had moved, though it was reported Wilcox was to; at sundown yesterday he had not. Besides, there is as yet no evidence that Mahone has gone after Warren. He was in reserve and may have moved only to save an expected attack on the South Side road. The cavalry we are sending out will, perhaps, bring us positive information of any considerable movement against Warren. Unless there is such, and even then, I hardly think my reserves will be sufficient to complete the investment and hold the new line against the forces in front, and against a probable attack in the rear from the troops detached after Warren, should they return on being advised of the danger. I should therefore be in favor of waiting more positive information before making a movement. The commanding general directs that with all your available force and a detachment of the Third Pennsylvania Cavalry, under Major Walsh, which has been ordered to report to you at once, you proceed, with as little delay as practicable, down the Vaughan road to the intersection of that road with the Halifax road, and then endeavor to ascertain whether the enemy is talking of the movement of General Warren, and after reaching the point indicated you should send a party toward the Boydton plank road by the road passing Gravelly Ford and Friend’s Meeting-House. The object of this expedition is chiefly to obtain intelligence respecting the operations of the enemy, and it is supposed that from citizens and contrabands you will be able to learn whether he has sent any troops down the Boydton plank road. The cavalry have returned. They found a force at the crossing of Hatcher’s Run by the Vaughan road, said to be Young’s brigade of cavalry, which prevented any farther progress, and, as it was nearly dark when they reached there, the officer withdrew with a loss of some five or six wounded. I have directed [him] to start at daylight to-morrow and try the Halifax road crossing, which is lower down, but his force is so small that if the enemy undertakes to hold Hatcher’s Run with his cavalry he can easily bar the passage to my small command, which is only about a regiment. I think it very probable Hoke has come over [to] this side, leaving Field and Kershaw north of the James. I am quite satisfied Lee will offer a stubborn resistance to any attempt on the South Side road. I don t think he can detach a force so far as will at all jeopardize Warren. He may harass and interrupt the work of destroying the railroad, but Warren has roads to the eastward with means of crossing the Nottoway at any point, and can always withdraw. The difficulty of taking advantage of Lee’s detaching against Warren is to get positive information of the fact in time. The only certain information will be Warren’s report, unless deserters should come in to-night or to-morrow morning I send you the last report from signal officer. If the Confederates guarding the Vaughan Road crossing at Hatcher’s Run were part of Young’s Cavalry Brigade, their identity is still unclear to me. Colonel J. Frederick Waring was in temporary command of Young’s Brigade while Young himself took a large number of dismounted men with him back to Georgia to try to find horses. Waring kept a detailed and consistent diary during 1864-65, and it is clear he and his mounted men were with Hampton chasing Warren’s raiders. Perhaps this force was some remaining dismounted men of the brigade, or perhaps Waring had detailed some men as pickets and neglected to mention them in his diary since he wasn’t present with them. Or perhaps the Union recon mission was mistaken as to the identity of the Confederates. In any event, this is a loose thread I still need to track down. OR XLII, P3, page 865: Meade to Grant. December 8, 1864—10.45 a. m.
OR XLII, P3, page 868: S. Williams to Meade. December 8, 1864—1.10 p. m.
OR XLII, P3, pages 877–878: Meade to Humphreys. December 8, 1864—9.30 p. m.
OR XLII, P3, page 910–911: Carncross to Miles. December 9, 1864—1.45 a. m.